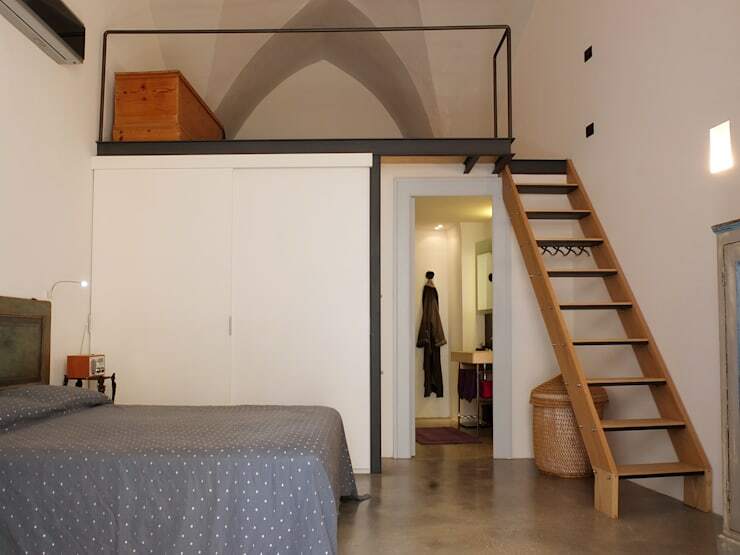 The one-room studio we'll explore today is just 65m² and has the most incredible vaulted ceilings. It's located deep within a maze of old streets in the ancient Italian city of Gallipoli and has all the character and charm of a typical old building from this area. 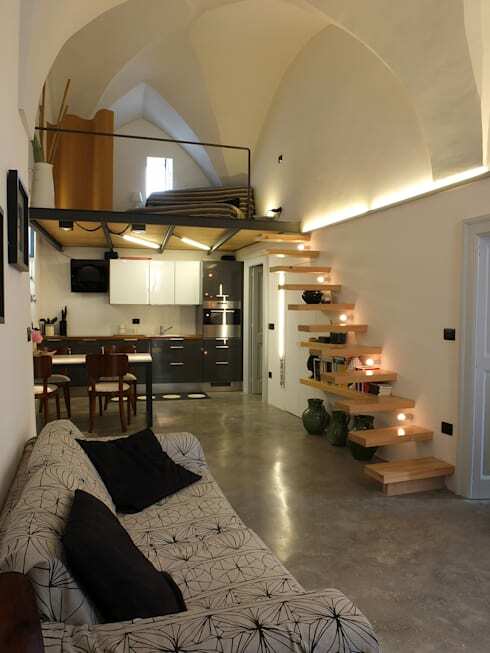 Italian architects Ossigeno, have refurbished into a lofty home for one and used mezzanines and simple, modern elements to make the most of its vast height. So prepare yourself for some old Mediterranean charm and come with us on a photo tour. It's a completely unique little home, but it also poses lots of solutions for those living in any kind of small apartment with high ceilings. The standout feature in this small home is of course the vaulted ceilings. The home has no side windows so light was an obvious problem. The architects have sought to combat this problem by using classic Mediterranean whitewashed walls and keeping it as one vast space. The recessed lights running along the mid section of the wall further encourage the eye upwards and draw attention to the height of the room—this making it feel spacious. In order to keep the space feeling bright and spacious, it was best to keep the internal structures such as the stairs as lightweight and simple as possible. 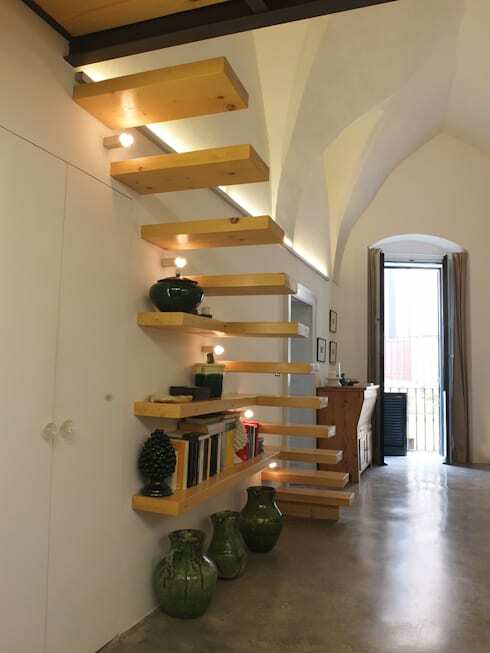 It's a floating staircase design, so the lack of risers allows as much light as possible to flow freely throughout the space. 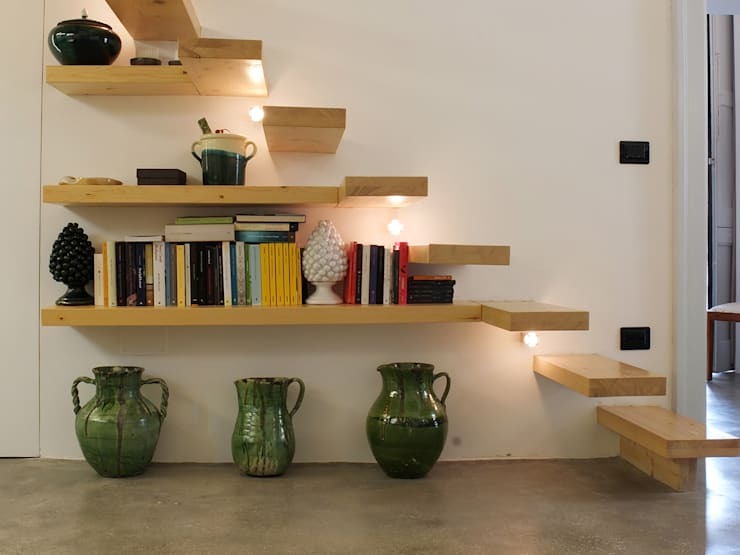 Small spaces also need multifunctional elements, so the simple wooden staircase also doubles as a simple shelf area. 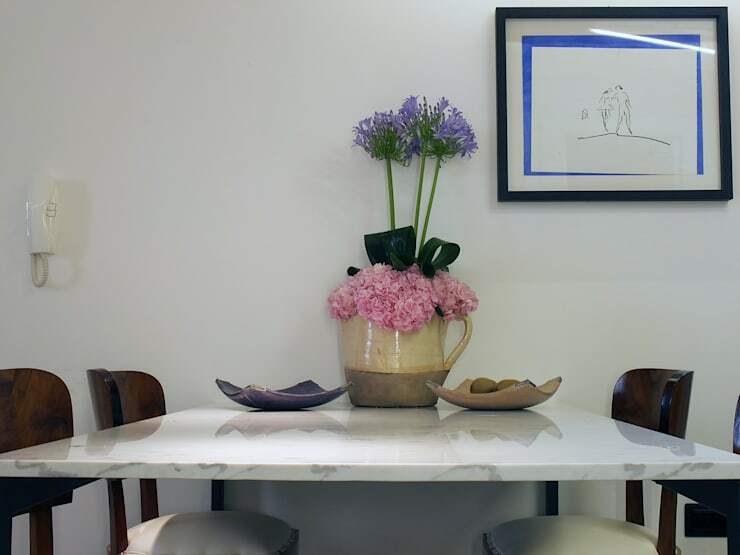 Big bold ceramics add to the simple, vibrant and youthful feel of the home. The kitchen needed to be fairly simple and run along one wall. The kitchen cabinets are modern, minimalist and maintain the lightweight, simple feel of the home. It's interesting to see how the highly polished cupboards reflect some light. 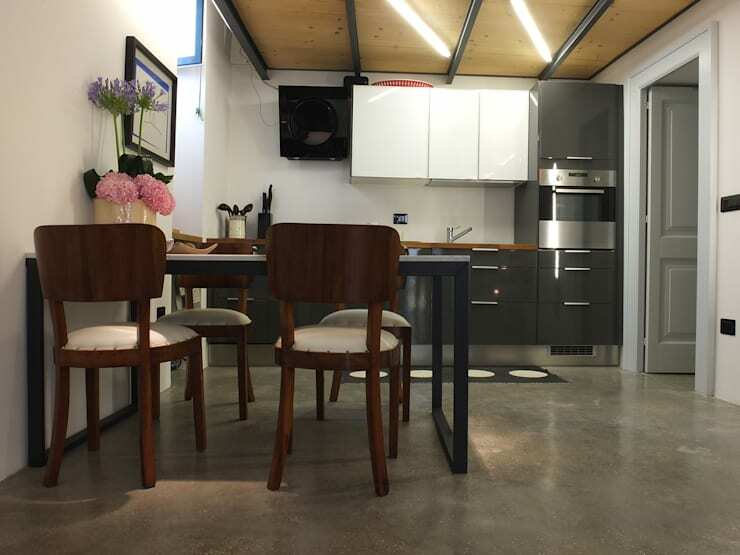 Also, note polished concrete floor. This is a home where the basic underlying structure is the real attraction, so the architects have kept the style simple, authentic and slightly industrial. Leading off from the kitchen is a second room that functions as a bedroom. This room also has another mezzanine that could be used as a small living area, reading nook or storage area. 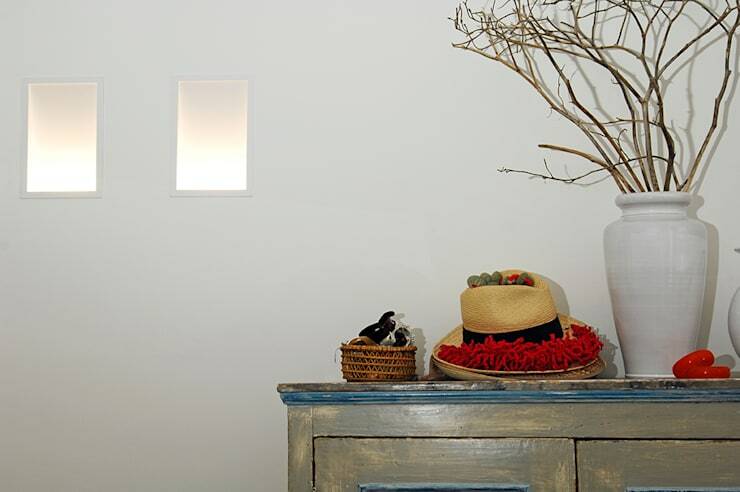 The new internal structures such as the built-in cupboard and bathroom walls are white and unobtrusive. They don't add to the visual weight of the room. This helps keep the room feel quite neutral so the original charm of the building remains the main focus. 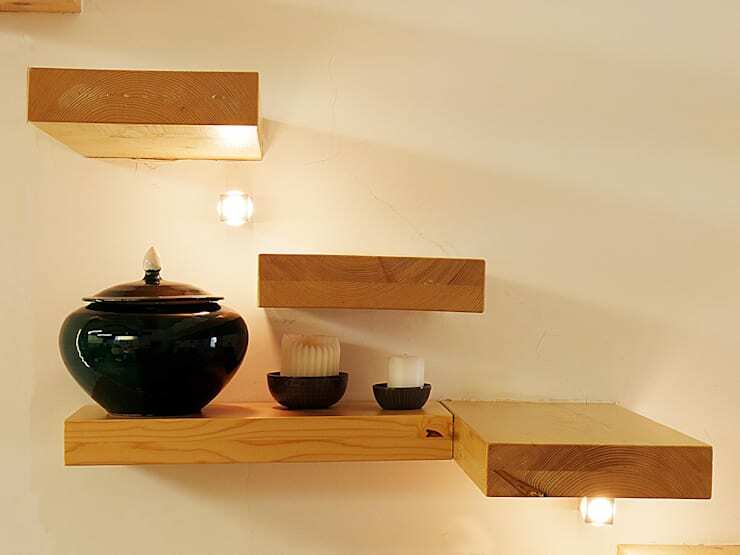 Of course, this also helps to make the home feel bright and uncluttered. The bathroom is a classic example of how to make a small bathroom feel functional and spacious. 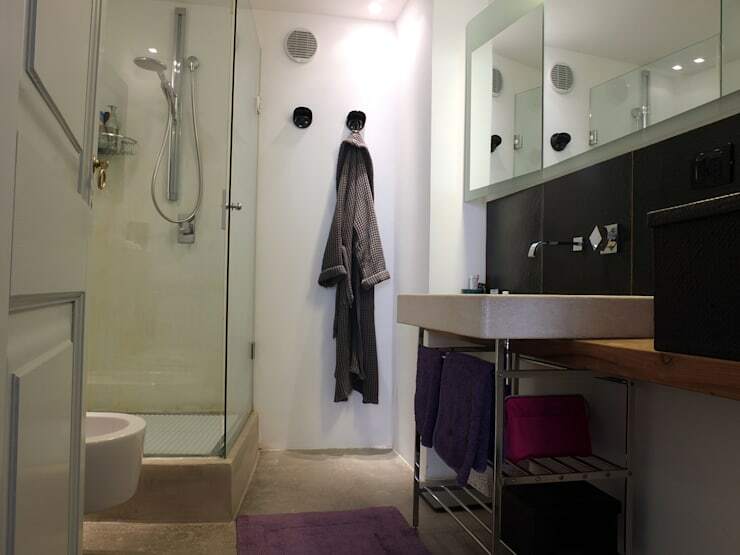 There is good wall storage, a shower room with transparent walls and good accent lighting. Also, cast your eyes to the wall-mounted faucet on the right. It's these little things that make all the difference in a small home. Finally, in a unique home like this there is little need to add a lot of decoration. It's the bare bones of the building that should remain the star attraction. 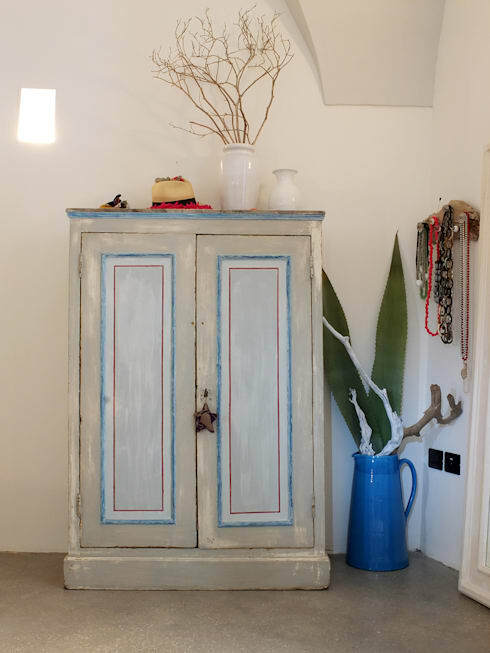 For our last photo, we'll have a look at the rustic, upcycled furniture. With just a few elements and some bold ceramics we have a home with unique style. It's key of course to avoid a cluttered look in a small home. So the interior designers and decorators have used sparse elements and gathered them together to create big shifts in scale. 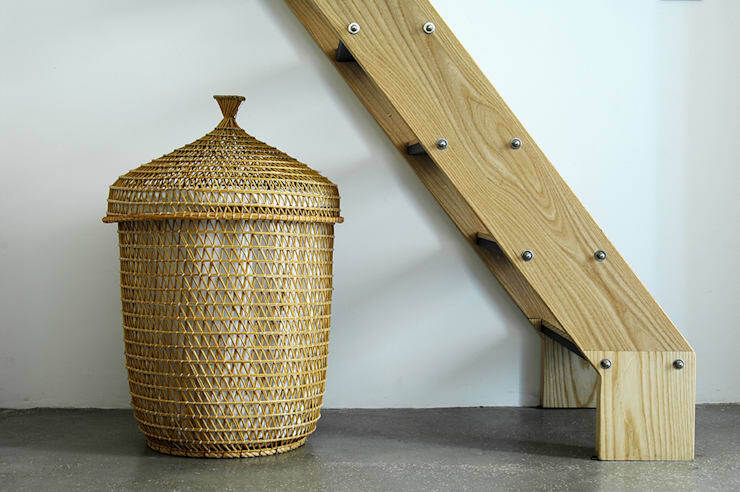 These little things also add to the historic charm of the home. If you want to see more of this home keep scrolling. Also, for more home inspiration have a look at 8 simple ways to make your house feel like home. What do you think of the refurbishment of this old home?